China’s Foreign Ministry on Monday denied reports originating in Japanese media that 150,000 troops had been moved to the Chinese border with North Korea. 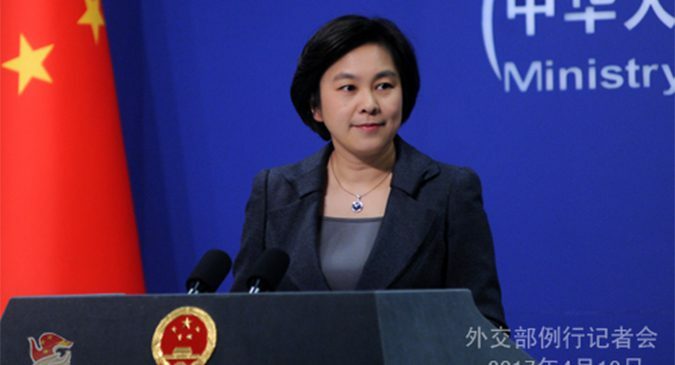 Speaking at a daily press conference in Beijing, Foreign Ministry Spokesperson Hua Chunying told reporters she was not aware of any additional soldiers being deployed to the DPRK’s borders. “There were similar reports by the Yonhap News Agency in the past, which were proved groundless and false in the end. I’m wondering where you got this information,” Hua said. A story from South Korea’s conservative Chosun Ilbo newspaper published on Monday claimed the Tokyo-based Sankei Shinbun had originally reported the troop movements. The Japanese article claimed the move was a response to the U.S. strike on Syria over the weekend, which had rattled Beijing. The Chosun Ilbo added the Sankei article reported the Chinese soldiers were training for a possible sudden outflow of North Korean refugees. Evidence for the claims came in the form of a video – since taken down – which showed troops being moved through the streets of Shenyang, a city over 100km from the DPRK’s border. The story was picked up by several outlets, like the UK’s Daily Mail, though they omitted that the Chosun Ilbo had called it a “rumor” in its headline. Beijing’s Foreign Ministry also gave a relatively muted response of the diversion of a U.S. aircraft carrier strike group towards the Korean Peninsula. The move was announced on Sunday, with the Carl Vinson Strike Group lead by a Nimitz-class aircraft carrier instructed to sail north from Singapore on April 8. “China has been closely following the developments of the situation on the Korean Peninsula. We believe that, given the current situation, all relevant parties should exercise restraint and avoid activities that may escalate the tension,” Hua said, during the press briefing. The strike group’s redirection from Singapore is in line with comments made by U.S. President Trump last week, although the U.S. Navy generally maintains a similar group in West Pacific led by another Nimitz-class carrier the Ronald Reagan. But Naval Today reports the Ronald Reagan is currently receiving maintenance in Japan. The Ronald Reagan aircraft carrier is part of the U.S. Navy’s 7th Fleet, which since 1994 has been charged with the defense of the South Korean Peninsula. Subscribe to read the remaining 449 words of this article.